LXNet2OpenDMX is a small utility that allows you to connect one universe of Art-Net or sACN (e1.31) with an OpenDMX USB interface. LXNet2OpenDMX allows an OpenDMX USB widget to be used as a dmx output for software that supports Art-Net/sACN such as LXConsole. LXNet2OpenDMX listens for Art-Net/sACN packets and sends the level data from the first universe as DMX vis the OpenDMX USB interface. OpenDMX USB widgets are available from ENTTEC. An OpenDMX widget is a USB-to-Serial-to-EIA-485 converter. You can make your own using an FTDI "Friend" such as this one from Adafruit and a MAXIM 481 driver IC. 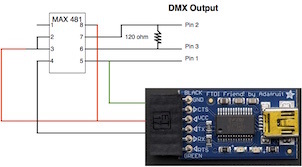 The OpenDMX USB interface requires an FTDI D2XX driver. To use the D2XX driver with the most recent versions of OSX, it is also necessary to install D2XXHelper. LXNet2OpenDMX 0.2.3 (B12) is available for download.